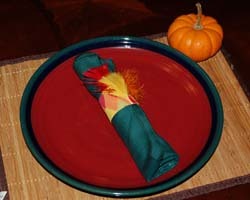 These Indian headband napkin rings are wonderful Thanksgiving crafts for children to make. Perfect for a school project, or to make at home, the process is very easy yet the end result is cute napkin ring that really looks beautiful on your table. These are toilet paper tube crafts, and very economical to make! All the more you need is some paint and some craft feathers. Several can be put together very quickly. Enjoy! 1. Begin the Indian headband napkin rings by measuring 1.5 inch sections of the empty toilet paper roll. Use a marker to mark the measurements and then cut each section with some scissors. Have an adult do this part. 2. Now is the fun part! Decorate the rings any way you choose. I used tempera paints in red, orange and yellow. You could decorate each with a person's name, and have the napkin rings also serve as seat place holders for your Thanksgiving table. Or, the tube could be wrapped and glued with a decorative wrapping paper before cutting into sections. Or try decorating with stickers or Foamie shapes! 3. The last step is to glue on some pretty craft feathers. You can layer a few colors, or just glue one feather on the ring so you can see the painted headband better, you choose. 4. Roll up a napkin and thread it through the ring. These really make a pretty and useful decoration for the Thanksgiving table!